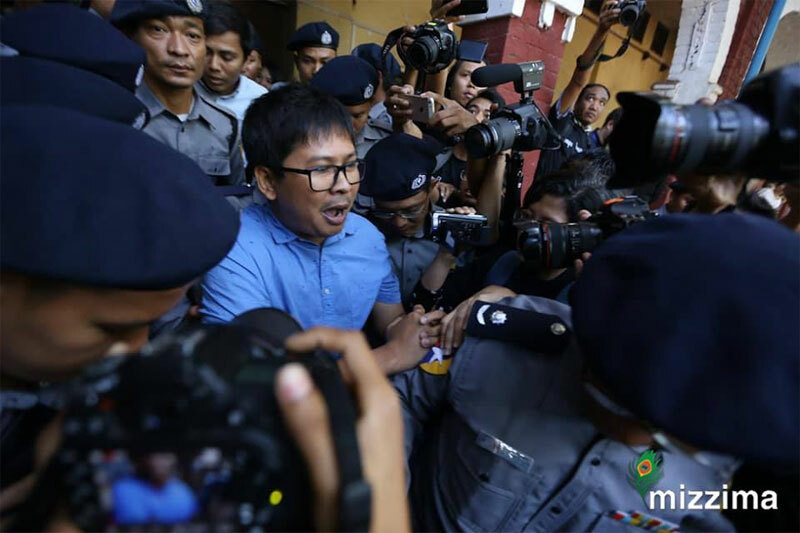 Two Reuters journalists were formally charged by police in a Myanmar court Wednesday for breaching a colonial-era secrecy law that carries up to 14 years in jail, despite calls for their immediate release. Myanmar nationals Wa Lone, 31, and Kyaw Soe Oo, 27, were arrested a month ago under the Official Secrets Act after they allegedly were given classified documents by two policemen over dinner. The pair had been reporting on the military campaign in the northern Rakhine state that has forced some 655,000 Rohingya Muslims to flee over the border to Bangladesh since August, violence the UN has condemned as ethnic cleansing. The issue is incendiary inside Myanmar, where authorities deny any wrongdoing during an army crackdown on terrorists from the Muslim minority. A police officer "filed the case to charge under the state secret (Official Secrets) act, section 3.1(c)," a district judge told the court. The section punishes anyone who "obtains, collects, records or publishes... any official document or information" which could be "useful to an enemy." The pair will return to the court on January 23 for legal arguments, when the bench will decide whether to accept the case under Myanmar's arcane legal system. Emotive scenes gripped the Yangon courthouse with the journalists' family members in tears and the reporters issuing desperate pleas before being led back to detention. "Please tell the people to protect our journalists," Kyaw Soe Oo shouted to the court. His colleague Wa Lone said his wife was pregnant adding: "I'm trying to be strong." The case has shocked Myanmar's embattled press corps. Journalists covering Wednesday's proceedings wore black in protest against their arrest, carrying banners proclaiming "Journalism is not a crime". "We applied for bail but the prosecutors rejected it," the journalists' lawyer Khin Maung Zaw told AFP. "So we are going to give arguments in detail in the next trial." Reuters insists its reporters have done nothing wrong, while their families have suggested the pair were set up. "They have done absolutely nothing but carrying out their legitimate work as journalists," said James Gomez, Amnesty International's Director for Southeast Asia and the Pacific. This week, former US president Bill Clinton also weighed in on the issue. "A free press is critical to a free society—the detention of journalists anywhere is unacceptable," he tweeted on Monday. "The Reuters journalists being held in Myanmar should be released immediately." The case has cast a spotlight on Myanmar's troubled transition to democracy after nearly five decades of military rule. It touches on both slumping press freedom and the Rohingya crisis, two issues that have raised questions about the country's ability to shake off the legacy of junta rule. Much of the Buddhist-majority population supports the army in what it calls a justified campaign against Rohingya terrorists after attacks against border guard police killed about a dozen last year. The military has severely restricted access to Rakhine to reporters, aid groups and observers. Suu Kyi's time in office has also been dominated by the Rohingya crisis, with criticism pouring in from around the globe over her refusal to denounce the army's crackdown and allow in international investigators.